We’d love your help. Let us know what’s wrong with this preview of As I Walked Out One Midsummer Morning by Laurie Lee. It was 1934 and a young man walked to London from the security of the Cotswolds to make his fortune. He was to live by playing the violin and by labouring on a London building site. Then, knowing one Spanish phrase, he decided to see Spain. For a year he tramped through a country in which the signs of impending civil war were clearly visible. Thirty years later Laurie Lee c It was 1934 and a young man walked to London from the security of the Cotswolds to make his fortune. To ask other readers questions about As I Walked Out One Midsummer Morning, please sign up. This is one of two books I inherited from my mum's parents, the other being Anna Karenina. I remember going up to my grandpa's house after he died and reading this, by an open fire, drinking Stones Ginger Wine the night of his funeral. I must have been about 16-17, and me and my brother were the only people in the house as our parents stayed with my aunt. Anyway, maybe it was the age thing, being hyper-sensitive because of the funeral, it being a windy, stormy night, or the ginger wine, but I re This is one of two books I inherited from my mum's parents, the other being Anna Karenina. I remember going up to my grandpa's house after he died and reading this, by an open fire, drinking Stones Ginger Wine the night of his funeral. I must have been about 16-17, and me and my brother were the only people in the house as our parents stayed with my aunt. Anyway, maybe it was the age thing, being hyper-sensitive because of the funeral, it being a windy, stormy night, or the ginger wine, but I read the whole thing in a night. Instantly it became one of my favourite books, and I read it loads leading up to, and at, college. Fifteen-odd years later, it's still as vivid and vibrant as I remember it. If anything it's got better, in that my understanding of the Spanish Civil War has (marginally) improved, and his early days in Putney now have a new resonance due to our six year residency there since the last time I read it. Laurie Lee fought on the commie-scum side in the Spanish Civil War, but doesn’t seem to have been much of a ideological commie. One chapter describes his encounter with the right-wing poet Roy Campbell, with whom he seems to have gotten along rather well. ‘Occasionally a day turned unhealthy, when idleness and ennui led to an outburst Laurie Lee fought on the commie-scum side in the Spanish Civil War, but doesn’t seem to have been much of a ideological commie. One chapter describes his encounter with the right-wing poet Roy Campbell, with whom he seems to have gotten along rather well. In 1934 Laurie Lee left his Cotswold home to walk south to see the ocean, then headed up to London. The nineteen-year-old played the violin on street corners for tips, and also depended on the kindness of strangers. A professional tramp who did a yearly circuit around England taught him some of the tricks of survival on the road. Since this was during the years of economic depression, there were also many men on the road looking for work. He worked as a laborer on a construction site and lived i In 1934 Laurie Lee left his Cotswold home to walk south to see the ocean, then headed up to London. The nineteen-year-old played the violin on street corners for tips, and also depended on the kindness of strangers. A professional tramp who did a yearly circuit around England taught him some of the tricks of survival on the road. Since this was during the years of economic depression, there were also many men on the road looking for work. He worked as a laborer on a construction site and lived in a rooming house for most of his time in London. Lee possessed a youthful energy, and enjoyed socializing with new acquaintances. Lee than took a boat to northern Spain, and traversed western Spain during the heat of the summer. Although the people in many of the villages where he stopped were poor, most of them were very kind to the young Englishman. Modern times had not arrived in the small Spanish villages, and the people had close ties to the land and the sea. The first signs of the Spanish Civil War were appearing when Lee was working at a hotel on the coast. He bonded with young people who were also impoverished--laborers and fisherman who were hoping for a better life when a leftist government came into power in 1936. War broke out between Franco's Fascist rebels and the Republican left. A British destroyer traveled down the Spanish coast picking up British subjects, including Lee, bringing them to safety. When Lee returns to England, he felt that he should help his Republican friends back in Spain. The epilogue is an exciting account of crossing the Pyrenees to reach the Spanish border. I’d already read Laurie Lee's autobiographical trilogy…. … around 2006, and loved each book. Just magnificent. In 2016, I reread As I Walked Out One Midsummer Morning (1969), and I am delighted to report it is every bit as good as I had remembered. Laurie Lee's childhood, so beautifully and evocatively related in Cider With Rosie is over and Laurie Lee I’d already read Laurie Lee's autobiographical trilogy…. Laurie Lee's childhood, so beautifully and evocatively related in Cider With Rosie is over and Laurie Lee is now a young man. Rather than hang around in Slad, Gloucestershire, the Cotswold village where he’d spent his entire life, in 1934 he set out to find out what else the world had to offer. Never having seen the sea, he walked to Southampton, and then walked onto London to meet his girlfriend and work as a labourer for a year before going onto Spain where he walked the length of the country. For the most part he leads an itinerant existence busking as a fiddle player to generate money to eat and drink. Laurie Lee’s poetic sensibilities are to the fore, and each page stunningly renders beautiful details of his day-to-day life: the landscape, the people he encounters, the smells, the food, the adventures, his feelings... If ever a book was written to give you wanderlust it is this one. That he is describing a lost world, on the cusp of modernity, makes it even more magical. This is possibly my favourite book, I re-read it every 3-4 years and will continue to do so. I think that is partly due to the fact that I first read it at 21 and I'm sure that like like most people my desire to experience new things without a safety net is strongest around that age. This book is about that; a young man sets out on a journey at a time when travel for its own sake was extremely rare for the vast majority of people, when leaving the county or even the village was something that som This is possibly my favourite book, I re-read it every 3-4 years and will continue to do so. This book is about that; a young man sets out on a journey at a time when travel for its own sake was extremely rare for the vast majority of people, when leaving the county or even the village was something that some never achieved. In 1934 the world is still recovering from the horror of the 1st world war but already preparing for the 2nd, the turmoil that will engulf Europe is under way and the main players already in position. This was less than 60 years before I read this book but in many ways it could have been centuries. The Spain he travels to is ancient and incredibly exotic although the people he meets are familiar in many ways. I love this book, it's about travel, fear, change but above all life. This has got to be one of the most evocative memoirs ever written; it certainly tops all the other road-trip/travelers tales I’ve read. As befits an award winning poet, Lee’s prose has a concise, 3-D image-making eloquence that drops the reader into the center of a scene, in the breathing presence of a character, or into the tactile truth of a landscape. In the mid-1930s, the nineteen year-old Lee sets out on foot from his Gloucestershire home, with a tin of biscuits and a violin, on his way to L This has got to be one of the most evocative memoirs ever written; it certainly tops all the other road-trip/travelers tales I’ve read. As befits an award winning poet, Lee’s prose has a concise, 3-D image-making eloquence that drops the reader into the center of a scene, in the breathing presence of a character, or into the tactile truth of a landscape. In the mid-1930s, the nineteen year-old Lee sets out on foot from his Gloucestershire home, with a tin of biscuits and a violin, on his way to London via a hundred mile detour to the coast “as I’d never yet seen the sea.” Two years later he is fortuitously “rescued” off the coast of southern Spain by the Royal Navy trawling the Spanish beaches for stray Brits marooned between the warring factions of the Spanish Civil War. Lee’s narrative of what happens in between these events provides priceless images of life as experienced by a penniless wanderer in depression-era Britain and pre-modern Spain. Few histories of an era or place can conjure its emotional and physical resonance quite so well as a living memory. In his description of life on the road to London, Lee is able to capture the essence of the failure of capitalism during the Thirties (our current failure being but an echo of it’s father). Beautifully written book about Laurie Lee's experiences as a nineteen-year-old walking through Spain just before, and as, the Civil War started. As much poetry as prose. Part of the effect is that he spends all but the last few pages describing rural (and even urban) Spain in 1934 as still living in medieval times, a state of serfdom, ignorance, poverty, disease, and filth that he observed but did not question. Suddenly the rise of the republican movement is an awakening for him as well as a con Beautifully written book about Laurie Lee's experiences as a nineteen-year-old walking through Spain just before, and as, the Civil War started. As much poetry as prose. Part of the effect is that he spends all but the last few pages describing rural (and even urban) Spain in 1934 as still living in medieval times, a state of serfdom, ignorance, poverty, disease, and filth that he observed but did not question. Suddenly the rise of the republican movement is an awakening for him as well as a connection for the reader with what the day to day life was like that gave rise to it. I must say I don't believe that he was quite as politically naive as he claims, but generally he communicates very clearly what it would have been like to experience the countryside and people without the preconceptions of a student of Spain's culture. He lived rough, and was able to see what life was like at dirt level. Laurie Lee was a teenager when he set out on that midsummer morning in 1934. But he waited 35 years before finally publishing an account of the long walk which took him through Spain in the run-up to the Civil War. This long gap of time gives the book its mood of intense nostalgia, with its sensuous descriptions of a vanished world. I loved reading this memoir and at times slowed down to make the enjoyment last longer. Actually, Lee went on two separate walks. First of all he left the Cotswolds Laurie Lee was a teenager when he set out on that midsummer morning in 1934. But he waited 35 years before finally publishing an account of the long walk which took him through Spain in the run-up to the Civil War. This long gap of time gives the book its mood of intense nostalgia, with its sensuous descriptions of a vanished world. I loved reading this memoir and at times slowed down to make the enjoyment last longer. Actually, Lee went on two separate walks. First of all he left the Cotswolds village of Cider With Rosie fame to walk to London, receiving much-needed advice from an experienced tramp on the way. Then, after losing his job as a building labourer, he decided to set off on another adventure, this time to Spain, taking his battered violin so that he could earn some money as a busker. At times, his account is a little hard to believe - for instance, could he really have lived just on handfuls of dates for days on end, as he claims? I'm also envious of his speed in learning foreign languages, since he seems to jump from knowing almost no Spanish to being able to argue over politics and bargain with strangers within a matter of pages. However, none of this really matters. The descriptions of the people he meets and the places he visits are compelling, putting across both the beauty of the Spanish towns and countryside and the extreme poverty of many of those living there, who invite him into their homes to share what little they have. The tastes, smells and most of all the relentless sun are all vivid and memorable, with his lifelong love for Spain informing every paragraph. Lee meets up with a couple of famous eccentric poets on his travels, firstly Philip O'Connor in London and then Roy Campbell in Spain, being welcomed into his home. The section about Campbell and his family is especially memorable and reminded me of Hemingway's accounts of the famous people he knew in A Moveable Feast, another book written many years later. At the end, the mood darkens as Lee witnesses the start of the Civil War. A ship arrives to take him and other stranded British travellers home, but he can't forget his adopted country and decides to return to join in the fight against Franco. He has to climb through the French Pyrenees in the snow before finally getting back to Spain. I now want to go on to read about what happened next in A Moment Of War, the last volume of his autobiographical trilogy. The year is 1934 and the 19 year old Laurie Lee is about to leave his Gloucestershire home, to walk to London. His mother feeds him his last breakfast, standing just behind him with a hand on his shoulder. Few words are spoken, but it is an emotionally charged goodbye. As he walks up the hill out of the village he glances back and waves, before walking away from the only place he has ever known. First though, he wants to see the sea, so heads towards Southampton through the English countryside j The year is 1934 and the 19 year old Laurie Lee is about to leave his Gloucestershire home, to walk to London. His mother feeds him his last breakfast, standing just behind him with a hand on his shoulder. Few words are spoken, but it is an emotionally charged goodbye. As he walks up the hill out of the village he glances back and waves, before walking away from the only place he has ever known. First though, he wants to see the sea, so heads towards Southampton through the English countryside just as summer is beginning. He scratched a living out by busking with his violin, before heading east along the coast and then North to London where he was to reunite with daughter of an American anarchist, Cleo. He gets a job as a labourer on a building site which enables him to stay in London and rent a room. As the building work reaches completion, he starts to consider where to go next, Europe beckons and he chooses Spain purely because he knows a single phrase in the language. A ticket is bought and the next stage of his journey begins. Around a year after he left the village of Slad, he sets foot on Spanish soil for the first time and he sets off to explore the country. Wandering from place to place, he joins some German musicians in Vigo before moving onto Toledo where he stays with a poet from South Africa called Roy Campbell. Following a loose plan of walking around the coast of Spain takes him to Andalusia, Málaga and a brief sojourn into the British territory of Gibraltar. He finds work in a hotel over the winter and in the evenings joins the locals in a bar talking with them about the current political turmoil. Early in 1936 the Socialists win the election and the simmering tensions boil over into acts of revolt and then into open warfare. A British destroyer arrives to collect British subjects from coastal towns and villages and Lee says goodbye to Spain. I felt it was for this I had come: to wake at dawn on a hillside and look out on a world for which I had no words, to start at the beginning, speechless and without plan, in a place that still had no memories for me. Laurie Lee's autobiography of his childhood in rural Gloucestershire, "Cider with Rosie", is a classic. This book continues with his leaving home aged nineteen, walking to London via Southampton (where he learns busking techniques) and some of the South Coast, having his first publication of a poem, working as a building site labourer and then spending a year living and walking in Spain. He came from an impoverished background and his sympathies are always with other disadvantaged people he meets Laurie Lee's autobiography of his childhood in rural Gloucestershire, "Cider with Rosie", is a classic. This book continues with his leaving home aged nineteen, walking to London via Southampton (where he learns busking techniques) and some of the South Coast, having his first publication of a poem, working as a building site labourer and then spending a year living and walking in Spain. He came from an impoverished background and his sympathies are always with other disadvantaged people he meets on his travels. He was also observant and articulate, many of his descriptions of the places he sees are delightful, even when what he is describing is far from picturesque. He is young, with a youthful sense of adventure, and he indulges in a young man's activities of drinking and chasing girls, but is also resourceful and responsible for his age and rarely indulges to excess. He falls in love with Spain, its people and their dreams of a fairer society. He and another Briton are 'rescued' from the Civil War and although he leaves, it is no surprise that he decides to return and join the International Brigade. This book ends as he crosses the Pyrenees and enters Spain again. His wartime experiences inform the next book, "A Moment of War". This small book is such a delight to read, it is at the same time a glimpse into ancient Spain [albeit 1934] and a door opening onto Spanish culture today. The cover illustration on my copy, by Pauline Ellison, is flooded with fresh spring green, just like the valley I look out on today on this chilly Spring day. It is the account of the author’s walk from Vigo on the Atlantic coast, south to Castillo in AndalucÍa. Written by a young man who knows just one Spanish phrase, he earns pesetas from p This small book is such a delight to read, it is at the same time a glimpse into ancient Spain [albeit 1934] and a door opening onto Spanish culture today. The cover illustration on my copy, by Pauline Ellison, is flooded with fresh spring green, just like the valley I look out on today on this chilly Spring day. It is the account of the author’s walk from Vigo on the Atlantic coast, south to Castillo in AndalucÍa. Written by a young man who knows just one Spanish phrase, he earns pesetas from playing his violin and so sees Spain on the verge of Civil War. The thing that stays with me after reading it is the hospitality from everyone he meets along the road, people who have little share that little with him. It is something we experience here every day. Our neighbours are all farmers, scratching a subsistence living from harvesting olives, wheat, sunflowers, raising pigs and horses and puppies, and labouring in the fields, they are generous with their smiles and their vegetables. It is not uncommon on a country road to see a small white van parked in the shade and one man with a mattock, hoeing in a large field of weeds. When Laurie Lee’s violin finally breaks in Málaga, dried out by too much sun, the people at the inn where he stays do everything they can to help, making glue in their saucepans. The makeshift solution, so Spanish in itself, does not work but he is given a violin for free and continues on his way, finally leaving Spain on the eve of war on a British warship. Finally, today I finished reading this second sequel to his Cider With Rosie (Vintage 2003). Indeed, I had bought its Penguin edition and kept them at bay for years, hoping to read his famous memoir first but I couldn't make it till last year in December 2017. Then last month I came across this new second-hand copy at the DASA Book Café in Bangkok and decided to buy it because, in the meantime, I needed some interesting books to read. As an overview, we can see from the contents that there are a Finally, today I finished reading this second sequel to his Cider With Rosie (Vintage 2003). Indeed, I had bought its Penguin edition and kept them at bay for years, hoping to read his famous memoir first but I couldn't make it till last year in December 2017. Then last month I came across this new second-hand copy at the DASA Book Café in Bangkok and decided to buy it because, in the meantime, I needed some interesting books to read. As an overview, we can see from the contents that there are altogether twelve topics: London Road, London, Into Spain, Zamora-Toro, Valladolid, Segovia-Madrid, Toledo, To the Sea, East to Malaga, Almunecar, War, Epilogue. I still found his narration amazingly readable with less dialogs than his first memoir and no graphic drawings. However, Sunday Times has rightly acclaimed that "He writes like an angel" (back cover). I think some readers couldn't help wondering how or feeling doubtful regarding such a verdict; therefore, we should find reading the following exemplary extracts fantastically amazing as those unique kind of travel-lit memoirs in English we should enjoy with unthinkable pure jubilation and dictated fate. After he had reached Zamora one Saturday evening, he sat wondering where he would spend the night. Out of the blue, he heard the sound of waltzy-gusts-of Strauss music from a nearby street. He went to have a look and found three German students named Artur playing the violin, Rudi his accordion and Heinrich the flute. After an hour of sitting on the platform listening to the music, he was eventually invited to dance with an unused girl. In the War chapter, he was confirmed on a British destroyer from Gibraltar to collect him. As well as the destroyer took action as commanded. Laurie Lee's classic travel book, abridged by Katrin Williams. Read by Tobias Menzies. I forgot everything but the way ahead. I walked steadily, effortlessly, hour after hour, in a kind of swinging, weightless dream. I was at that age which feels neither strain nor friction, when the body burns magic fuels, so that it seems to glide in warm air, about a foot off the ground, smoothly obeying its intuitions. Even exhaustion, when it came, had a voluptuous quality, and sleep was caressive and deep, like oil. It was the peak of the curve of the body’s total extravagance, before the accounts start coming in. In Valladolid, he buys a bottle of wine and a bag of plums and takes them down by the river. There, under the mulberry trees, where some thin grass grew, I sat watching the slow green flow of the water. The shade from the trees lay on my hands and legs like pieces of cool wet velvet, and all sounds ceased, save for the piercing stutter of the cicadas which seemed to be nailing the heat to the ground. Then on to Málaga and finally to the village of Almuñécar, where he decides to hole up for the winter. The poverty of the fishermen is grim: they “labour without mercy, dignity, or reward” to haul nets ashore, then “gathered round...in silence, while the few kilos of sardines, a heap of dirty silver, died flickering in the sand.” He is still there in July 1936, aiding local anarchists as the Spanish Civil War begins. Spain was a wasted country of neglected land—much of it held by a handful of men, some of whose vast estates had scarcely been reduced or reshuffled since the days of the Roman Empire. Peasants could work this land for a shilling a day, perhaps for a third of the year, then go hungry. It was this simple incongruity that they hoped to correct; this, and a clearing of the air, perhaps some return of dignity, some razing of the barriers of ignorance which still stood as high as the Pyrenees. “Rescued” by a Royal Navy destroyer, it is only as Lee leaves that he begins to understand the country, and the minute he gets back to his Gloucestershire village we know he will feel bound to return to Spain. A beautifully written elegy for a world we have lost. An initially aesthetic encounter with Spain culminates in a political awakening. I loved going on Laurie Lee's adventure with him. He set out as a village boy in 1934 to "seek his fortune" in the time honored way, heading first to London. Along the way he played his violin for tips. I especially enjoyed reading his tip-getting and music-choice advice, since I've been a busker myself. I've played some of his selections myself. His tales of fellow wanderers--and there were many during the Depression--were interesting and varied. Some of the people he walked with or worked with, I loved going on Laurie Lee's adventure with him. He set out as a village boy in 1934 to "seek his fortune" in the time honored way, heading first to London. Along the way he played his violin for tips. I especially enjoyed reading his tip-getting and music-choice advice, since I've been a busker myself. I've played some of his selections myself. His tales of fellow wanderers--and there were many during the Depression--were interesting and varied. Some of the people he walked with or worked with, as well as his girlfriend Cleo, contributed to his political education with books and speeches, but mostly it was his life experiences, including a strike, that influenced his left-leaning views. Some of the people he encountered while still in England encouraged him to write and many gave him something to write about. Meeting so many people from all backgrounds was a great experience for a young man with literary dreams. During his year or so in London, he had plenty of time to experiment and develop his craft. When his building job in London came to an end, he decided to move on to Spain--supposedly because his knowledge of foreign languages was limited to a single sentence in Spanish! Throughout the book he took a bit of poetic license with his accounts and I have to wonder if that was his real reason for choosing Spain. At one point he wrote: "I felt it was for this I had come; to wake at dawn on a hillside and look out on a world for which I had no words, to start at the beginning, speechless and without plan, in a place that still had no memories for me." Whatever his reason to travel to Spain, it was an interesting time to go there, with the Civil War about to break out. He had many adventures in Spain, living in many different towns and meeting all kinds of people. From German students escaping the rise of Hitler to circus acrobats, from corrupt bureaucrats to teenage whores and revolutionaries, he encountered interesting, frightful, amusing characters whom he described vividly. Among these were the poet Roy Campbell and his wife Mary, who introduced him to the art of El Greco and expanded Lee's view of poetry. At the end of the book, war broke out and Lee went back to England. He wrote, "One moment I'd been climbing a mountain in a sparkle of sunshine; the next, the whole visible world had gone." His adventure was abruptly at an end. However, he soon decided that his place was in Spain, among the peasants and paupers he'd met there. He continued his account in the third book of his trilogy. I'm looking forward to reading that. With his wonderful descriptive writing and his thoughtful musings, it is bound to be fascinating. 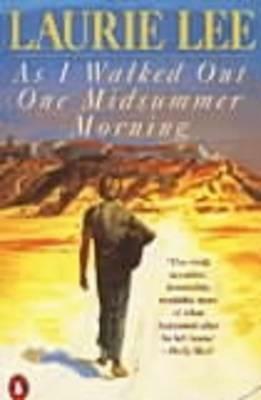 “As I Walked out One Midsummer Morning” is the portrait of a young man adrift in a country poised to tear itself apart in civil war. This is the journey of a man from childhood through adolescence and finally to the brink of soldier hood. And yet for that, this book feels a bit like looking at beautiful vacation slides of your buddy who “found himself” backpacking in Europe. Yes, the pictures are pretty, and occasionally we see a glimpse of a companion here and there, but there’s not much narrat “As I Walked out One Midsummer Morning” is the portrait of a young man adrift in a country poised to tear itself apart in civil war. This is the journey of a man from childhood through adolescence and finally to the brink of soldier hood. And yet for that, this book feels a bit like looking at beautiful vacation slides of your buddy who “found himself” backpacking in Europe. Yes, the pictures are pretty, and occasionally we see a glimpse of a companion here and there, but there’s not much narrative, structure or development going on. There are two big disparate segments of this book. The majority of the “Midsummer Morning” is a recounting of the wanderings of the author. Lee lavishes beautiful language on the landscape of Spain and his travels evoke the sad beauty of that time and place. Lee goes busking around the countryside, has his adventures, and meets plenty of people, but doesn’t really seem to develop much as the biography goes along. His travel companions are interesting but pretty one dimensional, and they come and go as the needs of the author demand. Eventually, foreshadowed only weakly, comes the second part of the book- war. A bunch of poor people pop out of nowhere, the country is on the verge of civil war, and Lee declares his strong convictions about the justness of the communist cause. The whole thing seems completely sudden, and totally caught me off guard. Now, certainly Lee could’ve well been oblivious to the signs of conflict breaking out, but even in retrospect it seems to catch him by surprise. How he came by his strong convictions is not explored or even much hinted at beyond a word or two about the seductiveness of communism. These two parts of the story are almost completely separate, and neither one seems to lead anywhere in particular before the book ends. There is an attempt to draw the two together by the mirrored departures at the beginning and end of the book, but it’s not enough to give the whole thing a sense of cohesion. Not to say that “Midsummer Morning” doesn’t have its moments of beauty, but as a whole I feel it’s hampered by a general formlessness. The other books written by this author are categorized at the beginning of my edition under “Travel” and “Poetry,” two descriptors which I think nicely sum this book up too. Poetry about a journey is nice, but in the end I’d like to know something about the person who is traveling, and where exactly all of his journeys are going to. This is the second part of Lee's autobiography, which starts famously with Cider with Rosie. But this is a very different book from Cider With Rosie. How does it differ? In Cider with Rosie Lee writes as an insider, part of the Cotswold village. This is more written about experiences observing another country and culture whilst travelling through it. Cider with Rosie covers 20 years, but in a way is timeless as it is as much about describing the life and rhythms of the village as it is about Lee This is the second part of Lee's autobiography, which starts famously with Cider with Rosie. But this is a very different book from Cider With Rosie. How does it differ? In Cider with Rosie Lee writes as an insider, part of the Cotswold village. This is more written about experiences observing another country and culture whilst travelling through it. Cider with Rosie covers 20 years, but in a way is timeless as it is as much about describing the life and rhythms of the village as it is about Lee's own experiences. As I Walked Out one Midsummer Morning covers 2 years, in very much a chronological sequence. Cider With Rosie is as much poetry as prose - this book has poetical moments but is much more fact sequence prose chapters, especially towards the end. In fact the end, which is historically interesting, is less interesting as a piece of literature. For these reasons, I can't really think of this as a sequel to Cider with Rosie, more another book written by the same author. It is well written, enjoyable and mostly interesting, although I do not think as unique or brilliant as the predecessor book. A wonderful book filled with wonderful writing. It's actually the second in a trilogy covering Lee's life before and during the Spanish Civil War. I haven't read the 1st or 3rd books but didn't feel like I needed them in order to enjoy this one. In the mid 1930s, when he was only 19, Laurie Lee left his childhood home in Gloucestershire (which he documented in the 1st book of the trilogy) to walk the world and experience life. A brief sojourn in London ends with a boat trip across the Chanel to S A wonderful book filled with wonderful writing. It's actually the second in a trilogy covering Lee's life before and during the Spanish Civil War. I haven't read the 1st or 3rd books but didn't feel like I needed them in order to enjoy this one. I loved Lee's ability to conjure characters with just a few sentences - some paragraphs were like flash fiction, they were so compact and full of life. He is also quite funny and moving at times, sometimes in the space of a few words. The way he got stuck with eccentric characters and loved "the road" made me think of Kerouac; and the way he brought forward funny details about these people reminded me of Gabriel Garcia Marquez. There's so much detailed memory here, either he kept detailed diaries throughout his wanderings or he embellished stuff years later when he sat down to write. But no matter, these are memories so filled with life that it's hard to fault it. A beautiful and poetic memoir, that is unputdownable from the word go. "The violence of the heat seemed to bruise the whole earth and turn its crust into one huge scar. One's blood dried up and all juices vanished; the sun struck upwards, sideways, and down, A beautiful and poetic memoir, that is unputdownable from the word go. "The violence of the heat seemed to bruise the whole earth and turn its crust into one huge scar. One's blood dried up and all juices vanished; the sun struck upwards, sideways, and down, while the wheat went buckling across the fields like a solid sheet of copper. I kept on walking because there was no shade to hide in, and because it seemed the only way to agitate the air around me; I walked on as though keeping a vow, till I was conscious only of the hot red dust grinding like pepper between my toes." I find much of the writing in this book outstanding, such perfect prose and intense imagery. I read it many years ago and have recently re-read it. Having forgotten how good it was, it was a pleasure to rediscover it. Set in the 1930s, the author leaves his family in the bucolic English Cotswolds and heads for Spain, crossing it on foot and with only his violin, busking as he goes. The Spain he describes is one of unrelenting heat, passion and poverty. A society where most had very little, often I find much of the writing in this book outstanding, such perfect prose and intense imagery. I read it many years ago and have recently re-read it. Having forgotten how good it was, it was a pleasure to rediscover it. Set in the 1930s, the author leaves his family in the bucolic English Cotswolds and heads for Spain, crossing it on foot and with only his violin, busking as he goes. The Spain he describes is one of unrelenting heat, passion and poverty. A society where most had very little, often sleeping on floors and with their animals. For anyone with an interest in Spain, this is a must. It is not often I get to read such lucid and whimsical autobiographical fiction. Narrating one’s personal story might be a struggle, but Laurie Lee makes it easy. The prose is fluid, convincing, and entertaining. Although flowery at times, it is enough to keep the reader’s attention in the story. This book is not just a depiction of a hero on an enlightening adventure. It is a historical report on Spain’s social and political circumstances during the 1930’s.